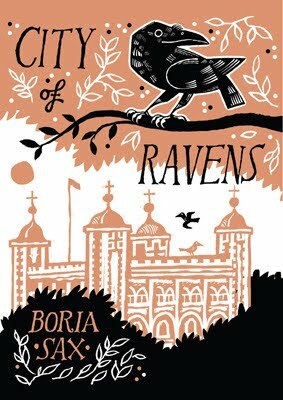 A book called City of Ravens, which I reviewed on A Bad Witches Blog a couple of years ago, claimed that wild ravens had not been seen in London for a very long while. At one time London had the nickname City of Ravens. This is thought to be partly because the name London can be translated as "town of ravens", partly because ravens are kept at the Tower of London, and also because ravens were a common sight on the streets of the capital in bygone centuries. "The book ends ... with a prediction that wild ravens could well return to the city as their numbers are growing in the surrounding countryside. Perhaps it will no longer be necessary to clip the wings of the birds at the Tower of London to stop them flying away, but instead offer sites for them to nest and breed..."
However, when I shared the recent news link with a few friends, one of them commented: "When I worked for RBS near the Barbican, there were two ravens in the park in the centre of in Charterhouse Sq. That was 1985." I asked my friend if they were sure they were ravens, not crows. They replied: "We had the Beeb (Springwatch, I think) camping out in the square, and David Bellamy came by too. So unless they were escaped pets, which is not impossible, then the Wapping story is ... misinformed." An intriguing issue - and I wonder if any keen birdwatchers can answer the question: Have wild ravens been living in London for decades, or have they only just returned? Do leave a comment below if you think you know the answer.